My passion for many years has been talking with family members and professionals around the country, listening to their stories of being with a person with dementia and empowering each to create moments of connection with that person and cocreate a more supportive community of care. A powerful truth has emerged from these encounters: One person can’t do it all when it comes to caregiving. Compassionate care is required for both the person with dementia and the care person. Because we as social workers are appropriately conscious of words’ impact on attitudes and approaches, this article will shift away from the term “caregiver,” in which unidirectional care is given to the person with dementia, instead using the term “care person,” which supports an understanding that the caring relationship is interactional and mutually beneficial for all. At every location and with increasing frequency, social workers and family members ask for guidance specifically about how to help the most dramatically isolated and overwhelmed 24/7 care person who is often seen as resistant to receiving help. To explore this problem, I interviewed more than 250 once-overwhelmed care persons who have not only survived their inundating and powerfully distressing experiences but thrived. Below is a summary of what I gathered. These once-overwhelmed care persons are certain that the currently overwhelmed have heard all sorts of self-care advice by now. As social workers, we are particularly well versed on the importance of self-care: get sleep and regular medical checkups, exercise, eat healthful foods, stimulate the mind, take a break from providing care, make time for you, go to a support group, socialize with people who energize you and make you feel good, and attend to your spiritual life. Hopefully, we actually follow some of this advice in our own lives. The common theme of the stories told to me by the once overwhelmed was clear: Their most difficult and isolating caregiving experiences began to transform when they started to discover themselves—where they were—in the mess and mix of caregiving and found a way to get something back. It required them to take action toward beginning to open to connections. Each found ways to connect with themselves and people and activities that nurtured them. From that came strengthening bonds with others—people in the family and community and, in some cases, a spiritual power. • Post an up-to-date list of emergency contact numbers. Social workers can easily make available a card of important resources, which can be lifesaving for many care persons. On the social worker line, I fill in my name and contact information so it is at the client’s fingertips before an emergency occurs. Nothing is more difficult than finding contact information during a crisis. Encourage care persons to fill in all contacts and post the list wherever it is most convenient and obvious, such as by the telephone or on the refrigerator. Posting it can be a helpful reminder that there are people available to help care persons whenever they are ready. • Post supportive notes around the house. Moment-to-moment reminders, such as inspirational phrases, quotations, reminders for self-care, and affirmations, helped many 24/7 care persons survive as they moved through their days. As they learned to post reminders for the person with dementia, they began posting notes to themselves all over their home—on mirrors, cabinets, television sets, toilet seats, counter spaces, bed posts—anywhere they would be sure to see them. They found these reminders caught them off guard and helped shift a tense or frustrating moment. Postings are easy for social workers to print and hand out with their contact information on the back. They are simple things that can open the care person, if even in a seemingly small way, toward the beautiful discovery that they are not alone. The most important offer of support is to show the 24/7 care person on a regular basis that we as social workers truly care about her or him. Care persons say the most consistently successful ways social workers touch their hearts are with the so-called little things—a sincere note of appreciation, a compassionate smile with meaningful eye contact, or weekly telephone calls (even if that means leaving a message). One social work agency mails little care packages every few weeks, perhaps containing Kleenex (for tears), a Hershey’s kiss (for sweetness), and inspirational cards (including an “I need help” card). Social workers’ actions, particularly when consistent over time, let care persons know we are thinking of them and help them realize they are not alone. If they have turned down an offer of help or not promptly returned a phone call, our actions let them know we are not taking their distancing personally. After all, they are not rejecting us; they are just trying to keep it together. The last thing they need to do is take care of everyone else’s feelings. 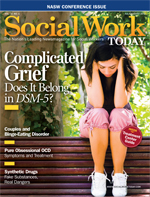 Social workers can certainly ask the care person if he or she has specific ideas as to what others can do to help. But if ideas are not flowing, we have a great opportunity to use our social work skills in facilitating family and community brainstorming. Then encourage others to gently offer some concrete services that the care person can accept or not. There are many tasks being juggled amidst the personal care. Care persons suggest that it is very helpful to be specific in offerings, such as providing a card that has the name of the person offering a service, what is being offered and when, and contact information. In our quest to find how we as social workers can be maximally available and effective, the once overwhelmed stress that the quest may be less about doing to or for than it is about social workers opening their hearts to being with the 24/7 care person and the person who has dementia. By taking even the smallest steps, and encouraging others to do the same, toward exploring the world of care persons and those with dementia, we can show how we are opening our hearts and demonstrating, in ways we may not yet see, that there is hope—hope that together we may be able to end the isolation and create a more compassionate, supportive network of care for everyone. — Nancy Pearce, MS, MSW, LISW, specializes in dementia care and is the author of Inside Alzheimer’s: How to Hear and Honor Connections With a Person Who Has Dementia.